In the first photo, see the pole with a nail in it? 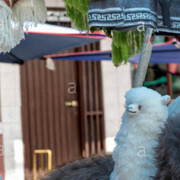 In South America, clothes vendors daily set up their stalls by hanging merchandise much higher up than they can reach, using a pole,...sometimes a pole with a hook, other times a pole with a simple nail in it. They get really good at this. I have a shelf up near the ceiling in my interior hallway. I installed that shelf myself before I was SCI. Being currently without an aide, and wanting to put a seldom-used item on that shelf, I decided to turn my frustration into a success story. 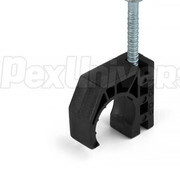 I attached a plastic pipe support (a hook that has a nail) to the end of a 3’ wooden dowel. I used a long twisty tie from the grocery store around the nail and the dowel. Then I cut pieces of duct tape in half, longwise, and wrapped the whole thing in duct tape. Inside the upper part of the boxed item, I placed a small, squarish, perforated plastic reinforcement backing. The plastic was from a watter bottle. I used an awl to punch the holes in the plastic reinforcement and in the cardboard box. 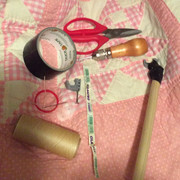 Then, using awl thread, I sewed the red plastic ring saved from the neck of a plastic milk bottle onto the top edge of the box. It worked on my very first try! I was able to put the boxed coffee-maker right where I wanted to store it,...’way up high on that shelf. And I didn’t need an aide to put it there nor should I need her to get it back down again. That’s the story of my low-tech invention — copied from South American clothes vendors who have used it for decades. lol You should be named MacGyver, Vintage very creative. I missed the 80’s. They happened without me. I was living out of the country, so some common references ‘go right past me’. I had to Google ‘Macgyver creative’ to find out what it meant. And I liked what I found. Here’s a nice article. I won’t post the whole thing, but it’s a good read. Good point, dewy. If you’ve never heard of MacGyver, you will soon. The 80s TV hit, about a secret agent who saved the world with a Swiss Army knife and some duct tape, is coming back in a big way, with a feature film, graphic novels and even a musical. But why will a show from the 1980s be so big in 2013? That’s what creator Lee David Zlotoff asked when he learned there was still demand for MacGyver. Upon closer examination, he found three key reasons. MacGyver never used a gun, and thus avoided conflict. MacGyver didn’t have fancy tools, but used his resourcefulness and ingenuity to turn what he had into what he needed. MacGyver approached all situations, no matter how frightening, with a sense of humor and humility. These elements are particularly important now because MacGyver represents a way to deal with the environmental and social issues we face. This is best explained by the description of the MacGyver Foundation, a non-profit funded partially by the proceeds of MacGyver projects. It supports people “who utilize self-reliance, non-violence and sustainability to improve people’s lives. Regarding Macgyver, the above article says, “...a secret agent who saved the world with a Swiss Army knife and some duct tape...”. This afternoon, two hours after my previous post, some items I’d ordered last week arrived at my door. Yes, the shipment includes my new, The Original, Swiss Army Knife, from L.L. Bean! I’ll try to live up to that moniker.